READER COMMENT: Is metadata collection the same as looking through the windows of every house looking for signs of terror but not entering? Target Energy, using your question's analogy: It's more like knowing who is in the room, for how long, where they moved, etc. and not specific "signs" of terrorism or anything else happening inside the house (i.e. the content of the phone call isn't known, just the callers on each end, duration, etc.). Content vs. content about content is the key distinction. So, if there is a suspicion of terrorism activity later on, officials could (under current programs as being reported) go back and see whether the metadata supports the thesis or opens more leads on what actually went down in the house. Much more on metadata in this great Reuters opinion column. Sen. Merkley holds up Verizon phone to Alexander, asks what authorizes the collection of data on his personal phone. Alexander says he wants to get it "exactly right" and suggests moving answer to closed hearing tomorrow and be considered for declassification. Committee Chair Mikulski asks for answer in writing. Sen. Collins (R-Maine) asks Alexander, true or false, if a Snowden could tap into virtually any call or email as said in an interview she saw. "False," Alexander responds. Wow. Merkley waving his cellphone & asking what investigation let NSA collect his data is the picture for this hearing. This hearing is rather like a cybersecurity vs. surveillance ping-pong match. Reuters: U.S. intelligence agencies will likely freeze some of Booz Allen Hamilton Holding Corp's projects temporarily, pending a review of how the company handles classified information, analysts said, trimming earnings estimates for the company's fiscal year. So what exactly is metadata? Simply, if the “data” of a communication is the content of an email or phone call, this is data about the data – the identities of the sender and recipient, and the time, date, duration and location of a communication. This information can be extraordinarily sensitive. If I'm recalling the same Alexander exchange you referenced, I believe he was saying that their data collection has a certain passivity, where they are not actively creating files on each individual's data, at least not without extra authorization when required. But if a case demands it, they can go back and map communications between people based on metadata, though not actual content of the communications, and identity comes into play. For more, Foreign Policy found these implications to be particularly troubling. Whoa. Mikulski, chairing Senate hearing, just directly called out a Tweeter who had said she's trying to prevent surveillance questions. 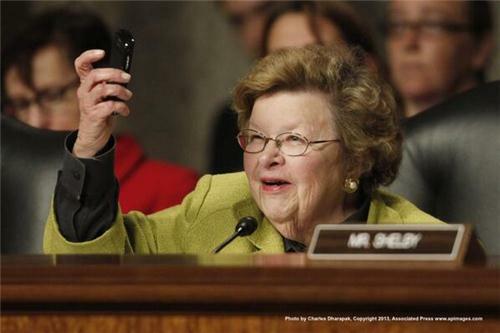 Mikulski quotes @RosieGray in the hearing! A TWEET from Rosie Gray. The CIA’s deputy director plans to resign and will be replaced by White House lawyer and agency outsider Avril D. Haines, Director John O. Brennan said Wednesday. Haines, who will succeed career officer Michael Morell on Aug. 9, has served for three years as President Obama’s deputy counsel in charge of national security issues and as legal adviser to the National Security Council. Although she has never worked inside the intelligence agency, “she knows more about covert action than anyone in the U.S. government outside of the CIA,” Brennan said in an interview. Morell served as acting CIA director twice and passed over for the top spot twice. FWIW, Morell is also the person SAOs say unilaterally edited the Benghazi talking points to make them fairer to the State Dept. READER COMMENT: National Security Indeed. Why is data on Journalists collected and retained? On Twitter, reporters are generally confused about Senator Landreu's coke bottle analogy. @Reader Fogarty, not sure about how rhetorical your question is, but either way, Jack Shafer's latest output and consideration of the leak phenomenon is right up your alley. Without defending Snowden for breaking his vow to safeguard secrets, he’s only done in the macro what the national security establishment does in the micro every day of the week to manage, manipulate and influence ongoing policy debates. Keeping the policy leak separate from the heretic leak is crucial to understanding how these stories play out in the press. See also: What war on the press? NSA has your phone records for 5 years. But needs 'reasonable articulable suspicion' to search them, provided by a court that never says no. Alexander says that there are good contractors working for NSA, but that there may be aspects of oversight that need to be evaluated. READER COMMENT: If (per Feinstein) the "vast majority of data is never accessed", and can only be accessed with a court order, then why store it? why not wait until it is needed. @Reader Bws, some of the questions on that were cut off for classification reasons, but Alexander broadly outlined the need to have a data repository in advance, so that you can go back to investigate incidents after they've happened and aroused suspicion -- whereas waiting until warning signs have appeared to collect might be too late, with the best evidence already in the uncollected past. There are certainly arguments on both sides of this, but that was Alexander's general stance today. Mikulski is now bringing the hearing to a close, acknowledging that it did not go in the planned direction (referencing NSA and surveillance news running through most questions), but that it was a "great hearing" serving American citizens concerned about their safety and information. Committee now stands in recess. READER COMMENT: How would Feinstein know? Is there anyone there you can trust? Does "being under oath" mean anything anymore. Clapper was under oath a few days ago when he answered "No ----not wittingly --no". Well, Snowden blew that answer! Thanks to our readers for joining our live coverage of today's congressional hearing, the first by an NSA official (in this case, NSA chief Gen. Keith Alexander), but certainly not the last after the Guardian and Washington post revelations of widespread U.S. government surveillance prompted by leaks from former NSA contractor and CIA employee Edward Snowden. Sen Ted Cruz voted for Sen Kirsten Gillibrand's plan to take military sexual assault cases away from chain of command. Armed Services committee did not pass Gillibrand's plan. She argued system needs to be changed after years of rising sexual assault #s.
FBI Director Mueller tells Senate panel FBI, intelligence agencies recognize American public expects them to protect privacy rights. Long week - Mueller is talking to a House committee, not Senate. And he's getting asked about #Benghazi. NSA Director Alexander says that Americans' safety and security since 9/11 is a "direct result" of the intelligence community's efforts to "connect the dots" and combat terrorist and other national security threats. Robert Litt speaking now about safeguards in place to present surveillance overreach as well as misperceptions about FISA court "rubber stamp" practices. Litt is general counsel of the office of the Director of National Intelligence James Clapper, who has come under fire since the Snowden leaks, particularly those about NSA collection of Verizon phone records, for prior congressional testimony denying broad collection of Americans' data. Litt: "Because this information has been made public, we run the risk of losing these collection capabilities." Rogers begins questioning after opening statements end, asking Inglis about specifics of phone call data. Inglis explains that tracked phone numbers are not tied to names or addresses. NSA sees other phone numbers in contact with the targeted number, as well as when that call occurred and the duration, but nothing else. Rogers asks Alexander if the NSA can "flip a switch to listen to Americans' phone calls or read their emails," Alexander responds no. Rep. Ruppersberger (D-MD) asks Alexander directly if FISA court is a "rubber stamp" court, Alexander says that calling FISA work a rubber stamp is like calling a marathon a jog, stresses levels of oversight and hard work of federal judges. Deputy Director Joyce responds to Rep. Thornberry's (R-TX) questioning about plot to bomb NY Stock Exchange cited as an example of surveillance disrupting terrorist activity. Joyce says that surveillance of a foreigner in Yemen led to conviction of those involved, which shows seriousness of the plot. NSA's Alexander is asked what #Snowden meant when he said NSA gives Congress 'special immunity.' Alexander: "I have no idea." Gen. Alexander: 1000 NSA systems administrators. Most are contractors. The government claims that the telephone records program that was the subject of the leaked Verizon court order is authorized under the so-called “business records” provision of the Foreign Intelligence Surveillance Act (FISA), first enacted in 1978. That provision was amended by Section 215[*] of the Patriot Act in 2001. Section 215 allows the government to obtain a secret court order requiring third parties, such as telephone companies, to hand over any records or other “tangible thing” if deemed “relevant” to an international terrorism, counterespionage, or foreign intelligence investigation. With respect to PRISM, the government cites Section 702 of the FISA Amendments Act, a law first passed in 2008 and reauthorized in 2012. Section 702 allows the government to acquire foreign intelligence by targeting non-U.S. persons “reasonably believed” to be outside U.S. borders. The law explicitly prohibits intentionally targeting people known to be located inside the U.S. at the time the government acquires the data. It also requires the government to establish certain “targeting procedures” to ensure that the government is targeting people “reasonably believed” to be outside the United States (which can be difficult to ascertain when dealing with internet or cell phone communications). Rep. Rooney asks panel members, "What's next for Mr. Snowden?" FBI Deputy Director Joyce responds, "Justice." Turns off his microphone. As Chairman Rogers wraps up the hearing, it's worth returning to the line of questioning from Rep. Schiff (D-CA) that many are picking over as a highlight of the past few hours. In particular, Schiff asked Director Alexander why the NSA can't request user information from telco providers only when needed, rather than creating extensive separate NSA databases, and Alexander said it was something to be considered. Schiff also keyed in on how court orders are applied to each data request, as well as whether FISA court opinions would be released as promised by the Obama administration, which the panel dodged. Such information would help evaluate the panel's claims that the FISC does not give "rubber stamp" approvals for surveillance. Marcy Wheeler, an online authority on surveillance and legal issues, pointed to Schiff's segment as indicative of the tension between members of Congress who are pushing for more oversight and safeguards as concerns rise over the intelligence community's powers to invade privacy and intelligence officials seeking to maintain levels of speed and breadth they say are necessary to combat serious terrorist and other criminal activity. Scroll down for the full rundown, which largely centered on representatives' concerns about the types of data collected and surveillance practices, as well as the damage to national security from the Snowden leaks and how to prevent similar breaches. There will also be more to parse from the NSA Director Alexander's claims that the surveillance in question has prevented 50 terrorist attacks and been a key post-9/11 pillar of Americans' safety.